So you think John Siracusa is brilliant. You read him assiduously (well, at least once every 18 months anyway). You don’t know the half of it! In his brilliant Ars Technica review of Lion, in one little throwaway link labeled ‘hmmm’ (here), John masterfully hinted on a Apple Cloud Laptop in the offing. I think he’s on the money. Lion has introduced a set of OS-level technologies and changes, that can finally make the ‘Apple Cloud Drive’ a reality – and with that, the Apple Cloud Laptop. Here’s my analysis of his analysis. Let’s go. It starts with File Revisioning. As John notices, the algorithms used to keep track of changes being made to files by users, required for the ‘Auto Save’ functionality introduced in Lion, stem from research on network filesystems. In some sense, the Auto-Save functionality is almost a side-effect of Apple’s relentless move in the direction of a Cloud-hosted (but locally sync’d) Hard Drive. Auto-save is part of the bigger story, too. In the (hypothetical) Cloud Drive, without pervasive Auto-Save, data pushes would need to be on-demand, when files are saved by the user explicitly. With this new design, if the applications support Auto-Save, the Cloud Sync can happen constantly, whenever connected, and whenever convenient; not when required, and in a hurry (imagine saving a large file with a lot of changes and hoping, praying that it gets sync’d up to the Cloud for backup before anything bad happens). What if your entire Home Directory happens to be encrypted? Not a problem. Home Directory encryption is now implemented on the Byte level, not as an encrypted disk image. Previously, if your home directory (hypothetically) lived on the cloud, encrypted, it could not be sync’d down efficiently – since every sync would required the full home directory to get sync’d byte-by-byte – all 100 gigs of it. Now, even if your home directory was encrypted, syncing to a canonical ‘cloud’ location can happen efficiently, since only the changes will need to get pushed. In fact, I won’t be surprised if having an encrypted home drive becomes a requirement for the Cloud Drive, as a secondary safety measure of confidentiality. I can imagine the increasingly large number of Government users would require this for sure! More hints that your Home Directory is about to move to the cloud. 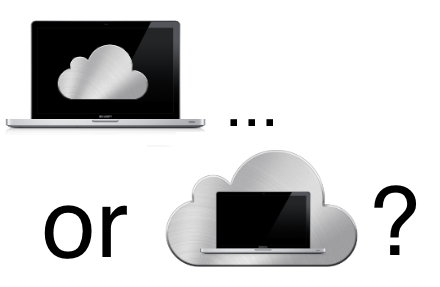 In fact, Lion introduces the ability to store the Master Credentials for your encrypted Home Drive in the Cloud. This doesn’t merely happen to be a convenient feature, it’s a requirement for a Cloud Home Drive to exist. Say your laptop dies, and you could restore it with all of your data, sitting pretty in the Cloud, wouldn’t it be a shame if you could’t get it back just because you last set the password 3 years ago? It’s also suspicious that Apple covers their bases regarding pricing – indicating that this recovery feature could, in fact, cost a separate fee. This lets Apple launch an innocuous Cloud Backup solution first, and charge for that in the interim. Mobile Time Machine – also a ruse. Time Machine now stores changes locally, when disconnected from the Internet, and syncs with the backup when connected back. This could be the same logic that the Cloud Drive uses to sync back after reconnecting; except that the changes will be the new auto-saved fragments, instead of the file-level constructs that Time Machine currently uses. So, what do you think? Will we see an Apple Cloud Laptop later this year? This entry was posted in Posts and tagged apple, random by amit. Bookmark the permalink.